The Harding Cup team celebrating their success last year. Credit: Fran Butler. 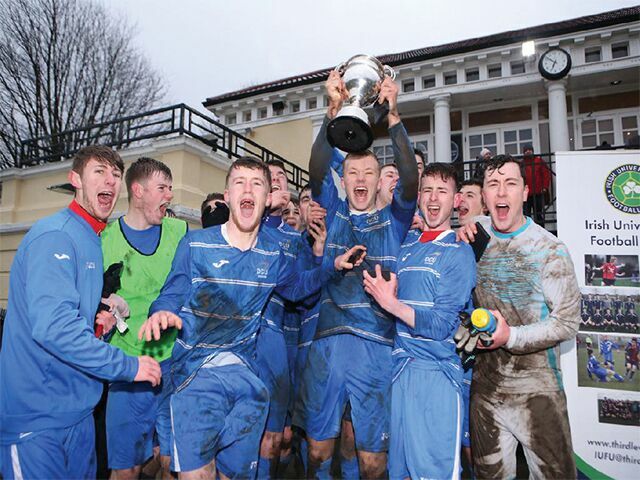 DCU are set to host the 2018 Rustlers Irish Universities Football Union Harding Cup for the first time in the college’s history. The three-day freshers football tournament will see Declan Roche’s defending champions take on UCD in the opening game of the quarter-finals in the AUL Complex on Thursday, February 22. The semi-final will take place in the complex on Friday before Tolka Park – home of Shelbourne FC and close to DCU St Patrick’s campus – hosts the final on Saturday. Roche led DCU to their first success in the tournament last year, when extra time goals from Jack O’Connor and Conor McKenna saw them overturn UCC 2-1 in the final in Trinity College. “It’s a great thing to look forward to, hosting it, after winning it last year,” Roche told The College View. “As I’ve said time after time, if you’re going to win any of the majors you’re going to have to beat UCD. We beat them in the semis [in last year’s Cup] and went on to win it. It’ll be no different this year. DCU’s Director of Sport James Galvin and last year’s winning captain – and St Patrick’s Athletic star – Jamie Lennon, conducted the draw which paired up the home side with their opponents from last year’s semi-finals. On that day, two goals from O’Connor – who topped the tournament scoring charts with five goals in DCU’s three games – sent the north Dublin university through to the final. The draw, along with pitting DCU against UCD, will see last year’s hosts Trinity College take on Mary Immaculate College Limerick, last year’s runners-up UCC face NUI Galway, and Maynooth University play University of Limerick. “On behalf of the Irish Universities Football Union I wish to congratulate DCU Soccer Club on offering to host the 2018 Rustlers Harding Cup,” IUFU chairman Terry McAuley told the FAI’s official website.